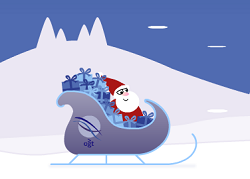 A LITTLE distraction from the lab bench is offered by Oxford Gene Technology with its online Santa catapult game. Instead of sending Christmas cards, OGT has made an electronic card with this playable game, and will reward the winner with an Amazon Kindle 3G. The challenge is to pull Santa’s sleigh back in the catapult, and adjust the height of the launch ramp, to achieve the greatest distance with the lowest number of presents lost. Participants are then invited to enter their name and email address for a chance to win the prize, which will be awarded to the player with the furthest distance. Play the game here, and feel free to share your best distance by using the Leave a Reply box below. We know that 350m+ is achievable, but just how far can a reindeerless Father Christmas be catapulted?